As the end of the year is coming, people usually take a moment to look at the past year and make the resolutions for the next year. I usually don’t do this, but this year I thought to myself “Why not?” So while the year 2012 is just around the corner, I decided to take a look at what I made this year and plan projects for the upcoming year. Least favorite bag: ah, it’s so sad to say, but I’d have to say it’s The Day Bag. Please don’t get me wrong- I would love to use it every day, but the leather is terrible and very unreliable and I haven’t used the bag for this reason! Very wrong choice of leather for the bag that supposed to carry a lot things... Lesson definitely learned. 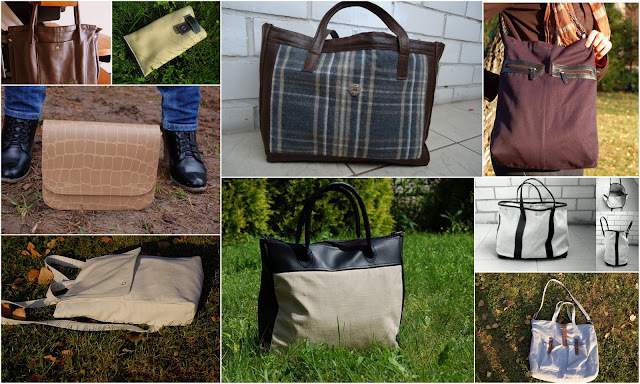 2011 was all about experimenting with sewing and searching for limits of what I can make at home, so quite often I took quantity over quality (you know, the situation “the more bags I make – the better”) and it was Ok, because, well, I had a lot to learn. However, 2012 should be more about the quality, because if the collection grows as fast as it does now, I’ll soon run out of space in my closet! Firstly, I’d like to make more classic shape bags since I love them (already have a top handled bag in my mind!). Secondly, make a bright color statement bag (maybe deep red? Or coral? Or green? Or… ?). And, last but not least, sew some clothing. Since starting making bags I put clothing sewing aside, but now I really need more clothes (especially good quality basic ones), so expect more entries on this theme next year!